We can sit here and argue about all the good and bad things technology has been giving us cyclists every other day we open our eyes. But some of the most mundane, personal issues we have with our bikes is repair and maintenance related. Getting to work on the bike yourself is perhaps the most personal avenue we can take to know our equipment more. You'll get to know what works and what doesn't, why this was designed this way, what can be improved about that design simplicity wise and so on and so forth. Hey, there's a reason for everything. For the many uninitiated in bicycle maintenance and repair, its easy to get lost in a host of books and online literature. I'm not saying they're necessarily bad, but they have their downsides as well. Think about it. Do you really want to read 3 and a half pages worth of information just to repair something small? Do you want to buy that expensive repair book over the counter and then find out that you're still lost? Time and money is really worth something these days. And don't we all learn better by doing, or watching people doing something? Visual learning is a really powerful tool and the internet media is quickly catching up. And if we discard some of the junk videos we have on YouTube and so forth, we can start to talk business. Alex Ramon is one of the latest movers and shakers in this field. 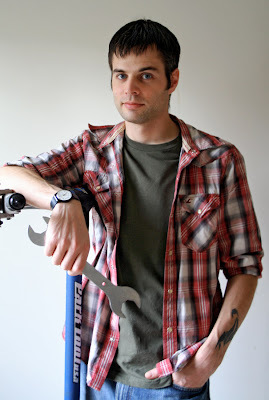 Those of you who don't quite know him might still have come across the young and growing Bicycle Tutor website. Alex is the owner and the calm yet friendly face in all of the videos. 1. Quality : Videos are super crisp and clear. Alex has taken a good initiative with his knowledge of video production and editing. 2. No Nonsense : Everything is absolutely to the point and concise. Some of the techniques may be slightly different from what we commonly are more familiar with, but it works well. 3. Communication : The site is built like an open forum. Written instructions complement the videos. Every video is almost like a blog post, in which users can immediately put in their comments after viewing. This is good because it adds depth to the material in each tutorial. Alex is also fairly quickly to respond to emails and he's among the few I've seen who actually acknowledges your time and effort in writing to him. 4. Presentation : Not all cyclists are in America or in the U.K. You want to hear good, crisp and simple tutorials in English. The presentation is very methodical. Everything has a step by step procedure to it. Thats how you learn. This site has the international focus. 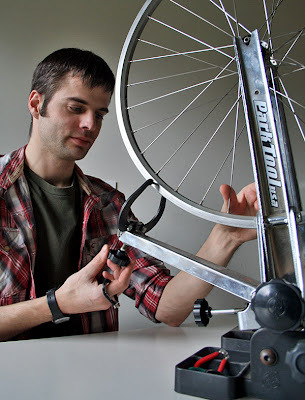 In all, Bicycle Tutor is raising the bar on repair tutorials. For a sample, here's one in which he talks about bottom bracket overhaul. Click here if the video does not open. Putting all my thoughts aside, I was lucky to catch up with busy Alex this past week and so, posed him a few questions. My questions and his replies follow. Enjoy the read as you get to know more about this young man and his background. Q. How did you get into cycling, Alex? I've loved bikes since I first learned to ride one. Growing up, I was a motocross and BMX nut. I did a lot of dirt jumping and vert riding at the local skatepark, but my real passion was flatland freestyling. Unfortunately when I was a teen I injured my hips and had to give up the sport. As an adult I discovered gears and started commuting to work, which I've done ever since. I also love cycle-touring with my camera as much as possible. Whenever I get the chance I also love fooling around on a unicycle. Q. Where did you work as a mechanic and how many years of experience do you have? When I was 16, I got my first job at Cap's Bicycles in Port Coquitlam, British Columbia. I learned a lot as a salesperson, but I was always envious of the mechanics and longed to get behind a wrench. In the end I left because I disagreed with the way they operated (kind of like a McDonald's for cyclists). A few years later I moved back to Kitimat, BC and applied at a local shop called Rock N' Road Bicycles. They were desperate for a mechanic and hired me on the spot. Les Dunlop, the shop owner, had a day job and needed someone to run the shop for him during the week. He took me under his wing and taught me everything he knew about bike repair and good customer service. I spent several years as the shop manager and mechanic before I felt the need to move out of town. It was very sad because my leaving forced them to close the shop. Les still repairs bikes out of his house on a casual basis. I then moved to Victoria, BC, where I applied at all of the bike shops and was quickly hired at Goldstream Cycles. I only stayed there for 6 months as I didn't agree with their customer service philosophy. Basically the owner was a real penny-pincher and I found it difficult to work with limited tools and respect. Soon after I left I was hired by Richard Miller at Fairfield Bicycles, which is where I had originally wanted to work. It was hands-down the best shop in Victoria (and possibly all of Canada). The focus was on customer service and quality repairs, and we were paid very well. We sold and serviced all makes and models of bikes: 3-speeds, electric bikes, hybrids, kids bikes, mountain bikes, recumbents, road bikes, touring bikes, tricycles, unicycles and anything else you can think of. All of the staff were well-trained and expected to perform all shop functions including management, sales and repair. Once every year Richard would always pick two of us to go to Interbike in Las Vegas. I'd say that trip (and meeting all those top-level industry people) was the highlight of my career. After I'd been there for just over three years we all decided it would be good to open a second shop in town. I was put in charge of renovating and stocking the new shop. It took several months to set up, and by the end of it I was quite burnt out. I decided to move to Vancouver and get a higher education. Q. Wow, very interesting. So in between all this, how did an idea for a tutorial website come about? When I quit working as a shop mechanic, I finished my degree and was hired by the Vancouver Public Library. While it's been a great job, I've really missed working with bikes, and I started feeling like all of my tools and knowledge were going to waste. I did a quick domain name search for bicycletutor.com one day, and I was shocked to see that it was actually available! On a whim I bought a video camcorder and a more powerful computer for video editing. After recording and uploading the first tutorial, I was blown away by the response, and I realized that there were a lot of people looking for this kind of website. All of the comments and requests I've been getting have kept me going since then. I look forward to covering as many topics as possible. In the future I'd like to get a proper studio with better lighting and video equipment. I'm also on the lookout for more bikes so I can cover the many different types of components. It's going to take a few years to get through all of the requests I've received so far, but the satisfaction that comes from helping others learn how to fix their own bikes is like nothing I've ever experienced! Q. Lastly, how this site is supported? You take all the initiative so I'm curious. So far this has been a solo project, and I've been paying for the expenses myself. I really don't mind since making money with this project is not a priority, although I do earn some small pocket change from the commissions on Jenson USA tool sales. I've also started offering download memberships which brings in a few extra dollars. My priority is to always keep the tutorials free for visitors. So make use of Bicycle Tutor and learn something new! Looks like he doesn't like WD-40. I use WD-40 to degrease at times, not lube. It is a great degreaser. One of the gotchas with the video is you can't print a video out, show it to co workers, give it to your friends. Or refer to it at your bike stand unless you have a laptop. Print tutorials will never die.